Most people who have never used a cane before don’t realize that there are correct and incorrect ways to use these devices. A cane seems simple enough, but using it the wrong way can actually create bigger problems for her than whatever inspired her to use the cane in the first place. Senior Care Roswell GA – Is Your Aging Adult Using Her Cane Correctly? Why Is This Important? If your elderly family member is finally open to using a cane, she’s doing so to improve her balance and to prevent a fall. But if she’s using the cane incorrectly, she could be more susceptible to a fall. Using a cane incorrectly can also make existing injuries worse and cause your aging family member to limp or to improperly distribute her weight between her feet. Using a Cane Isn’t Automatic Often people assume that using a cane is something that is natural and automatic. But that’s not the case. If your senior gets some instruction about how best to use her cane, it’s going to be far more effective for her. Your elderly family member may find that practicing with her cane helps her to become more proficient with it. But if she’s not practicing with her cane, she may find it more frustrating when she does try to use it. Talk to Her Doctor about Her Cane If you’re not sure whether your elderly family member is using her cane properly, talk to her doctor. The doctor can watch her use her cane and give her some tips while making sure that the cane itself is the right height for her. Her doctor may also recommend working with a physical therapist to ensure that she’s getting the best use of her cane. Daily Assistance Helps her Stay on Track It takes time, patience, and effort to learn how to use a cane properly and that can get frustrating. Hiring senior care providers can be a huge help to your elderly family member because they can keep her on track. When she needs that extra bit of help because using the cane is too exhausting right then, your senior has someone right there with her. When your elderly family member is using her cane properly, she’ll find that her mobility is much improved. She’ll be able to navigate even difficult situations much more readily and she’ll be far less afraid of falling. 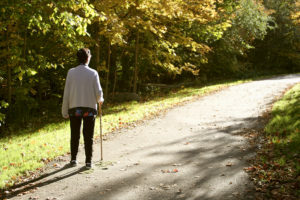 Ultimately, improving her confidence about walking is going to help her to maintain her quality of life. If you or an aging loved-one are considering Senior Care Services in Roswell GA, please contact the caring staff. Email: info@realmccoyhc.com • Phone 404-536-1060. The Real McCoy Home Care is your locally owned and managed in-home, non-medical home care agency. Serving North Metro Atlanta.